Many overlanders have a holy grail; some want to drive the Bolivian Death Road others the Road of Bones in Siberia. 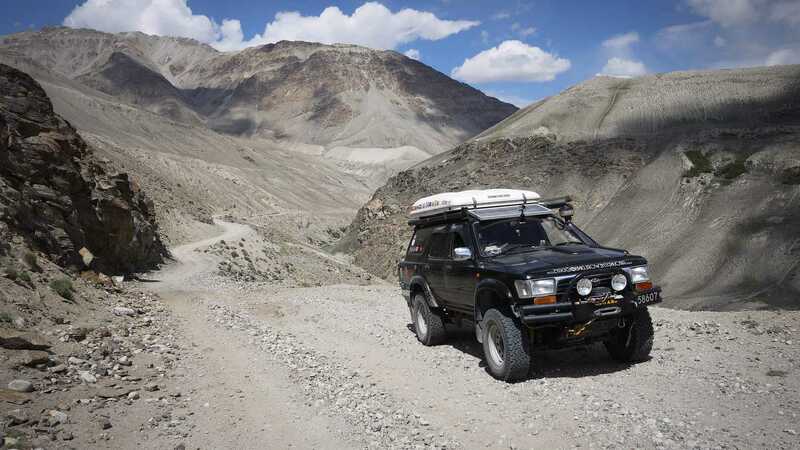 For us, the infamous Pamir Highway in Central Asia had been on the top of our list for some time. The M41, as it is officially known, is the world’s second highest international highway; the surface is mostly unpaved. 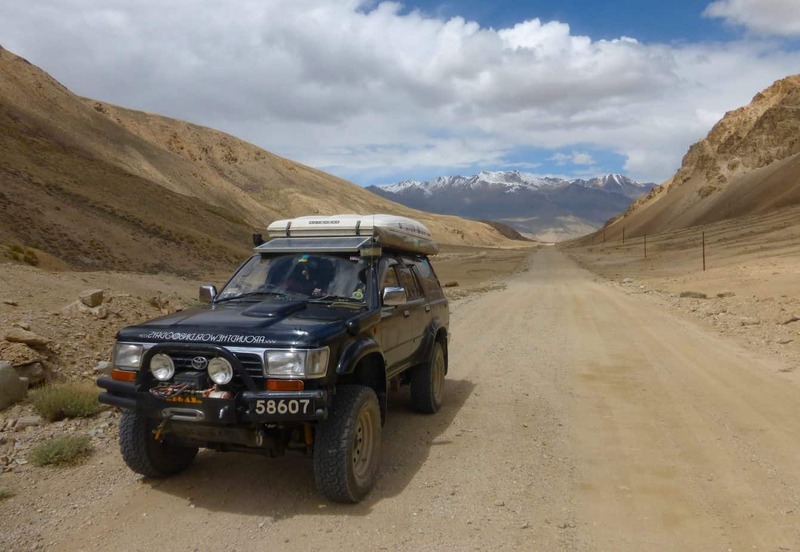 The road traverses the Pamir Mountains and travels through Kyrgyzstan, Tajikistan, Uzbekistan and Afghanistan reaching an altitude of 4,655 metres. Part of the highway requires a special permit as it passes through the autonomous region of Gorno-Badakhshan. The area is notorious for landslides, rock-falls, earthquakes, floods, high winds and frequent political unrest; all these factors rate it quite highly on the ‘World’s Most Dangerous Roads’ list. Traditionally the road formed part of the ancient Silk Road route linking trade routes from China to Europe. 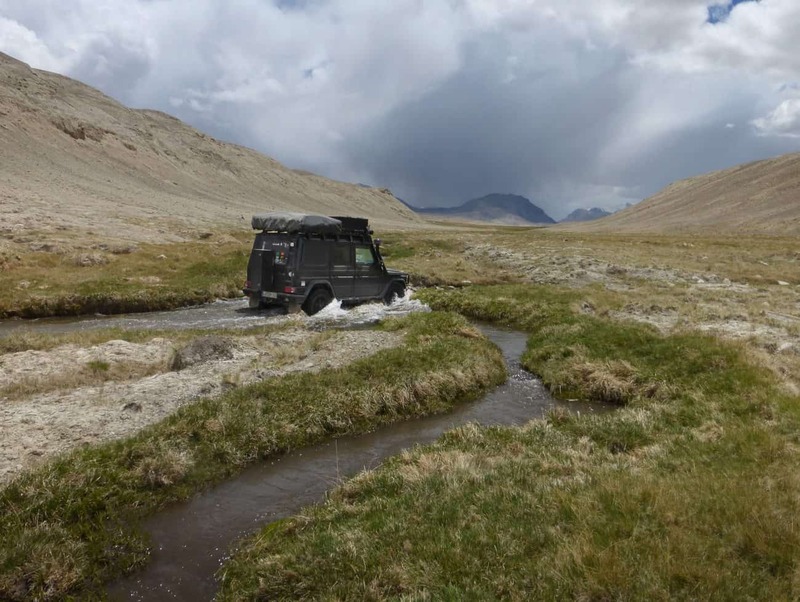 Due to political situations, Ebola, terrorism and a whole multitude of other reasons, overlanding in Africa is becoming increasingly challenging and risky; many overlanders looking for alternative routes have started following their compass to Central Asia. This became glaringly obvious looking around the car park in the small guesthouse where we were staying in the city of Osh, Kyrgyzstan. 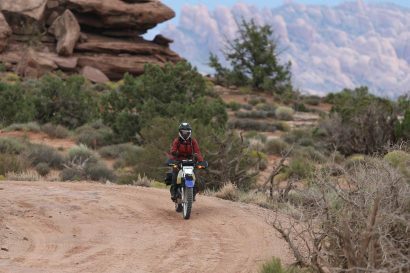 Landrovers, Mercedes and Toyota’s from England, Germany and Holland jostled for space amongst the adventure motorcyclists and cyclists. Over a few beers we made friends, heard stories, gathered tips and collected information about the availability of diesel from the adventurers who’d just completed the route travelling in the opposite direction. Whilst in Osh we were reunited with our overlanding German friends Stefan and Annette from “My Beast Goes East”. Our paths had crossed previously in Cyprus, Turkey and Armenia and we’d formed a great friendship built on a mutual appreciation of each other’s vehicles and a love of off-road driving. 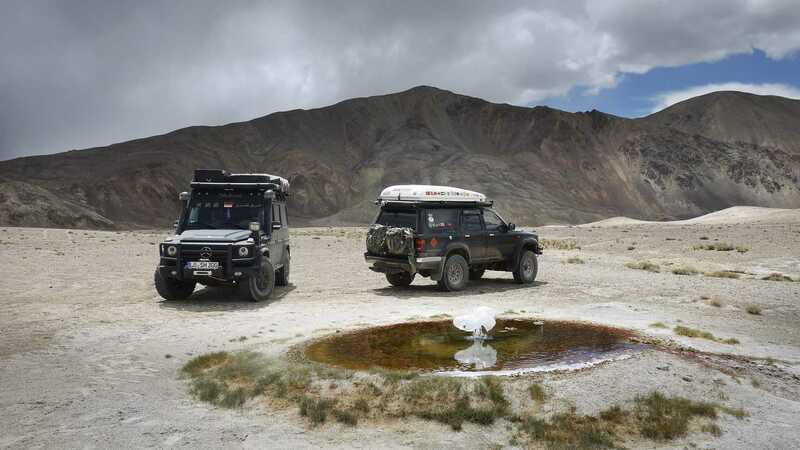 Stefan and Annette were heading for the slightly higher Karakoram Highway in China and were keen to test their incredibly well prepped Mercedes G-Wagon at altitude. 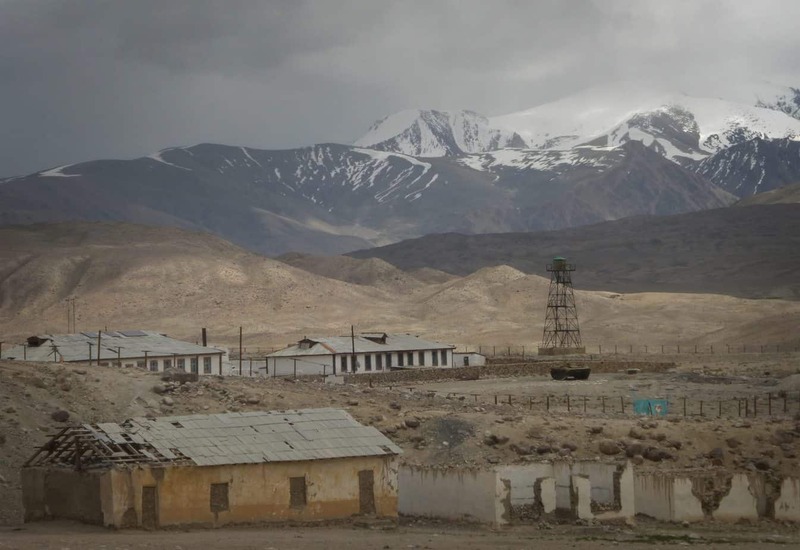 With our GBAO permits in place, together we apprehensively formulated a plan which included travelling down the Wakhan Corridor and along the Pamir and Panj rivers, which mark the Afghanistan border, via the market town of Ishkashim to Khorog. From Khorog we would explore the Shakhdara and Bartang Valleys. Our journey started on a sunny July day from Osh where we filled up with fuel. For us, this included carrying an extra 80-litres of diesel due to the lack of availability en-route; for our German friends with long-range fuel tanks this wasn’t a problem. Travelling in convoy we headed south towards the first pass of many. 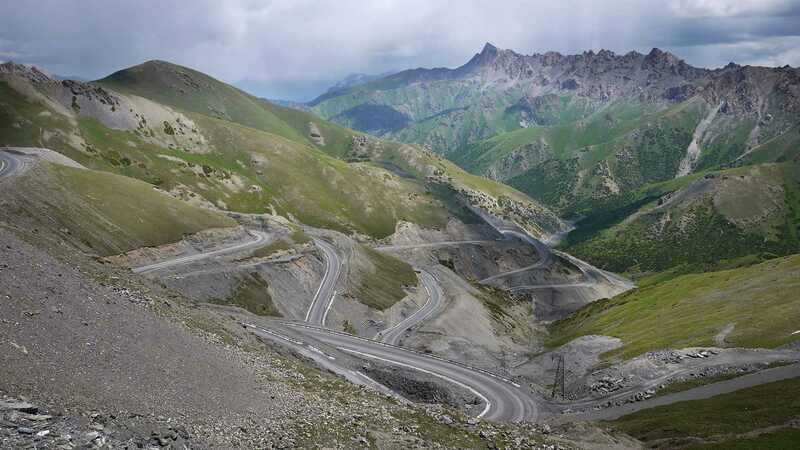 The 3,615 metre Taldyk Pass reached by a collection of stunning switchbacks heralds the start of the high altitude driving. The more severe symptoms of altitude sickness tend to occur at altitudes of more than 3,600 metres. In hindsight we should have taken the steep ascent a little slower. For the first two days of our adventure the sudden change in altitude left everyone a little breathless and played havoc with our sleep. We also suffered from some pretty atrocious headaches and dizziness, luckily this passed fairly quickly as we acclimatised to the height. The lack of oxygen also affected our vehicles, as we climbed the winding serpentines towards the pass our diesel engines began to kick out an increasingly large amount of black smoke. This continued throughout our whole time in the Pamirs until we dropped back down to under 2,000 metres. As we approached the border between Kyrgyzstan and Tajikistan, just beyond the town of Sary-Tash, our ‘check engine’ light illuminated. Thankfully due to the age of our trusty Toyota and its lack of complicated computer systems ‘limp mode’ most definitely didn’t kick in and we chose to ignore the little red light on the dashboard. Thankfully as we dropped altitude the light went off, only to return on again as we climbed. Looking through the error codes I suspected the light was coming on due to the lack of oxygen affecting either the turbo pressure sensor or the air intake sensor. Either way the illuminated light didn’t hinder progress. To be honest, we were crawling so slowly in parts any automatic ‘limp mode’ may have gone unnoticed! At 4,336 metres the border, one of the highest in the world, is a muddy, remote collection of shipping container cabins. In the harsh winter temperatures here drop well below -40°C, even on a sunny day in mid-July the air was a cool 8°C. Disconcertingly the border guards choose jeans, tracksuits and fashionable sweaters over “official” uniform, making the gun carrying even more unsettling. Like other borders we’ve encountered the various “departments” tried to extort negotiable amounts of money for sham services and taxes, including vehicle disinfection and a tax for tinted windows. Thankfully the information gathered from fellow travellers in Osh helped and after much light-hearted bantering we left the border paying nothing more than the official $25 for temporary vehicle importation. Once across the border we relaxed back into our seats and enjoyed the landscape, which was becoming increasingly lunar-like with every mile as we descended into a wide high altitude valley. A quick glance at the map indicated we were approaching the Uy Buloq Pass, from here the road skirts the border with China. A large chain-link fence ensures defection from communist China is not an option! Ironically a large hole in the fence meant Emma and I could stop the car and run across the border for a self-satisfying selfie (strict and very expensive rules on driving your own vehicle in China mean this is one destination disappointingly not on our agenda). The high altitude lake at Karakul was home for our first night of camping. Often called ‘The Black Lake’, Karakul was formed by a meteorite 10 million years ago and despite being extremely brackish is frozen for most of the year. Unwittingly we ventured a little too close to the lake shore and encountered an unusual undulating crust of thick spongy grass that rippled but remained unbroken as we drove across it. In potentially hazardous situations like this we were thankful to be travelling with another vehicle in case we got stuck. We spent the evening watching the ever-changing light across the mountains whilst reflecting about the days driving. In total throughout the entire day we passed only one other 4×4 and 3 adventure cyclists, a fact that reinforces just how remote this area is. The road south from Karakul climbs gently through some stunning landscape until it reaches the highest point on the whole highway. The Akbaital Pass is 4,655 metres high; just to put that into context the highest mountain in the UK, Ben Nevis ‘peaks’ at a mere 1,344 metres. On the approach to the pass we overtook an old struggling Russian truck. The driver, unaware of us undertaking, had his head out the window as his vision through the windscreen was completely obscured by the open bonnet of his overheating truck. Along with crossing the Tropic of Cancer and the Arctic Circle crossing the pass was another huge milestone for us and marked the highest point of our trip. With a few great tips from fellow adventurers we decided to make a round trip down some of the lesser-explored valleys southeast of Murghab. Leaving the main highway behind we headed off-road through the high altitude desert plains in search of the famous Marco Polo Sheep. 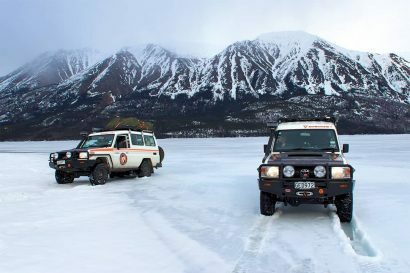 In this part of the world travelling independently by 4×4 allows you to reach places other tourists rarely get the opportunity to see. After a gruelling two-hour drive we found a stunning camp spot at the base of a mountain where the rare Marco Polo Sheep had reportedly been seen. A quick glance with the binoculars and we were instantly rewarded with a somewhat distant glimpse of this elusive creature. At these high altitudes our vehicles had trouble starting in the mornings and required at least 15-minutes of ‘warming-up’ time before they had enough power to even move. The initial lack of drive is very disconcerting when you nail the accelerator and the vehicle doesn’t move. After the first day we learnt to park downhill and let gravity do the hard work before the turbo had a chance to kick in. Once our vehicles were ready to face the day ahead we returned to Murghab, a small dusty town were electricity alternates daily between the two ends of town. It is one of only two towns along an approximate 500-mile stretch of the M41 where you can buy diesel. Murghab has at least five small filling stations; these consist of a huge storage tank, normally removed from the rear of a truck, where locals fill 2-litre plastic Coke bottles with petrol. After trying all five it became clear that diesel wasn’t going to be easy to find. Our next stop was a small café where hordes of Chinese truck drivers were eating meat dumplings. With a little negotiating we found a driver who was willing to siphon some diesel from his truck, unfortunately he wanted to charge us premium prices. After a short discussion we decided to look elsewhere, one hour later we found ourselves bartering for 50-litres of diesel in a small wooden shack on the edge of town. With a little apprehension and a good funnel with a filter we re-filled our Jerry-cans. At this point I was beginning to wish I’d spent the money on a water/diesel separator. In total finding fuel and re-filling took about 3-hours. Leaving Murghab we were stopped at one of many police checkpoints along the M41. 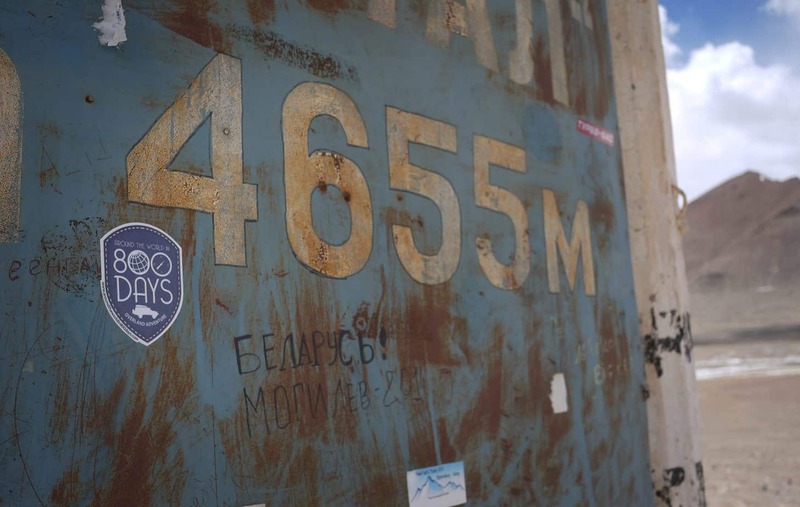 Our passports and GBAO permits were inspected and our information written in a huge ledger; protocol left over from Soviet times, with many of these checkpoints utilising old concrete Soviet bus stops. The road south from Murghab takes a sharp right turn and starts heading west towards the Neizatash Pass. 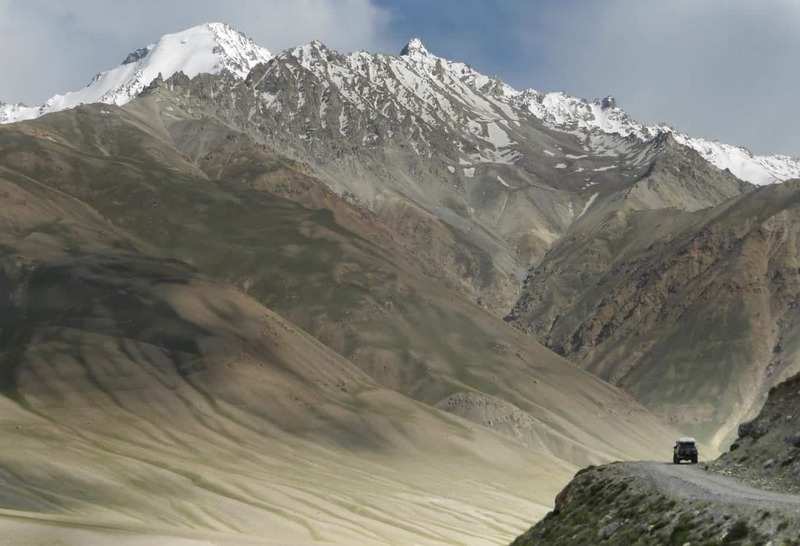 At 4,137 metres the pass marks the entrance to the beautiful Alichur Pamir valley; the steep Northern Alichur mountains in the north flank the road whilst the Southern Alichur mountains offer great vistas across the open valley. Our next off-road detour started at the tiny town of Alichur. A narrow dirt track leads 14-miles along a ridge high above the Alichur River before dropping down steeply into the valley below. The sheer descent required crawling in 4×4 low on rough loose gravel, the car slipping and sliding whenever we touched the brakes. Once in the valley basin we encountered several small water crossings from tributaries joining the main river. Again, travelling with another vehicle offered security and allowed us to travel across rougher terrain than we would normally risk alone. Towards the end of the valley the lake of Bulunkul marked the point where we headed directly south to leave the M41 and joined the lesser-travelled, rougher, more remote route down the Wakhan Corridor. Just one more pass, the Khargush Pass at 4,344 metres, and a strict border post (complete with tank and bombed out buildings) separated us from the narrow strip of territory in north-eastern Afghanistan that extends to China and separates Tajikistan from Pakistan. The corridor offers 220-miles of spectacular driving along the bank of the Pamir River, literally a stones throw across the water is Afghanistan. When we reached the isolated border post we were greeted by two gun-toting friendly young soldiers who didn’t seem old enough to be carrying battered old AK-47’s. The obligatory information was filled into another huge ledger before we were allowed to cross into the district of Ishkashim. Our first glance of the river revealed a raging brown torrent fuelled by the recent snowmelt from the higher peaks. Few vehicles travel this route, as the main M41 is an easier, safer alternative; travelling at this time of year is especially hazardous due to frequent flooding and landslides. The road from the border climbed steeply overlooking the sheer valley below. Before long the road became a narrow, barrier free track clinging to the rock edge complete with gravity defying overhangs. A little unnerved we continued to travel in convoy leaving plenty of space between our two vehicles. 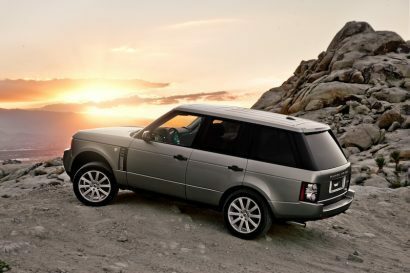 Heroically we let out German friends in their G-Wagon travel ahead; disconcertingly the vibrations from their vehicle would start small rocks tumbling on the loose scree next to the road. Just 50 metres across the river life continues in Afghanistan, the locals blissfully unaware of how alien the whole experience is for us. As we travel further down the valley we eventually leave the secluded stretch of road and arrive at the first of many small villages, from here traffic becomes more frequent and the condition of the road surface deteriorates from a relatively smooth dirt track to a truck laden, dusty, corrugated thoroughfare. It is at this point that the Pamir River merges with the Wakhan River and becomes the muddy brown Panj River. Finally we arrived in Ishkashim, a small edgy town with an atmosphere charged with tension. From here we had planned to attend the Saturday market just one mile across the river border in Afghanistan. Unfortunately due to political unrest and shootings the previous night the market was cancelled and the border closed. Feeling slightly uneasy we made a plan to leave early the following morning, minutes before our departure the hotel owner where we’d been camping informed us that the road ahead was closed due to a large mudslide that had happened overnight. Travelling in this area you soon learn that alternative routes simply don’t exist. We weighed up our limited options and decided we’d chance the mudslide over Afghans with AK47’s. We headed north towards the larger town of Khorog, 25 miles north of Ishkashim we encountered the mudslide! We left our vehicles at a safe distance and investigated the scene a little closer by foot. The recent rise in temperature had intensified the rate of snowmelt from the higher peaks resulting in a huge mudslide on the edge of the town of Kozideh. It had destroyed the solitary bridge out of town and narrowly avoided taking a couple of houses with it. Being the only route through the area the enlivened locals had wasted no time in clearing the debris. Using an ancient Soviet caterpillar they had bulldozed a rough path through 40 metres of mud and rock into the river, past a buried truck and out the other side. After several discussions with locals, Stefan and I established it was relatively safe. Our decision to cross was reinforced when we witnessed a battered old Lada Niva negotiate the new temporary crossing with ease. With lots of gesticulating from animated locals we engaged 4×4 low and entered the muddy bulldozed trench. Our German friends watched on waiting for us to exit before they entered. With relative ease we bounced and bumped through the mud and rocks into the river and climbed, wheels spinning, up the other side in a shower of mud. From Khorog we said our farewells to our German friends, Stefan and Annette who were heading along the main M41 back to Osh before continuing to China. Stay tuned for part two of Driving on the Roof of the World. You can follow Andy and Emma’s adventures at www.aroundtheworldin800days.com or on Facebook.